Value Investing » Investment Terms » What is CAPM? What does CAPM Tell Us? What is CAPM? What does CAPM Tell Us? 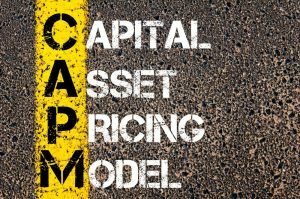 CAPM stands for Capital Asset Pricing Model. It is used to calculate the predicted rate of return of any risky asset. It compares the relationship between systematic risk and expected return. Typically, it’s used on stocks. However, CAPM can also be used throughout financial decision making to price riskier investments. When pricing them, it’s important to reach a balance between the price due to risk and the expected return – thus, using CAPM can help. The main idea and impulse behind using CAPM is that investors need to be compensated for two things: the time value of money and the risk they are assuming. CAPM takes both into account. CAPM determines the fairest price for an investment, based on the risk, potential return and other factors. Calculating an investment’s price using CAPM helps establish a fair value of stock, while also giving investors a number to use when comparing to the stock’s current market value. If the estimate is higher than the current market value, then the stock is currently a bargain – but if it’s lower, then the stock is being overvalued. CAPM gives you a good, comprehensive look at the risk versus rate of return on an investment, especially a stock. It’s a great tool to use when determining whether riskier assets are worth your investment. You will notice that the Capital Asset Pricing Model is very prescriptive, in the sense that it assumes that every asset has a beta that is easily calculated and this determines the expected return of the asset. Beta and the market rate of return describes every asset. This is possible in the universe where every market participant acts from the same playbook. In effect, if the markets are rational. CAPM makes the market efficient. And CAPM works if the efficient market hypothesis holds. Although CAPM and EMH are two independent theories, they both rely on the 3 basic assumptions: investors are rational, all information is instantly reflected in asset prices, and, there are no transaction costs. As a result, while we agree that these are good theories to hypothesize how the market works, and to use them as some sort of an empirical model, these theories DO NOT adequately describe the functioning of the capital markets. And therefore, while most investors have locked themselves up in the confines of these theories, we look for ideas and assets that continue to fall through the cracks. This is where value investing makes its presence known – where other investors do not tread.